The granting of citizenship for Wong Chin Foo was granted on April 3rd of 1874 in the Circuit Court of Kent County in Grand Rapids, the same day that he made his declaration of intent, also in Grand Rapids. Title by cataloger. 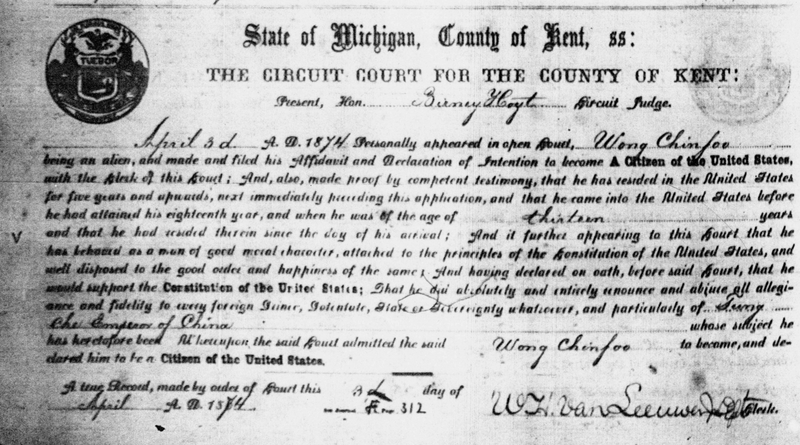 Because Wong Chin Foo immigrated when he was a minor and had lived in the US for five years, he was allowed to make his declaration of intent and receive his citizenship on the same day. Wong Chin Foo was not a resident of Grand Rapids, but this was one of the cities where he lectured as he toured the US. Perhaps someone in the audience who was knowledgeable of immigration rules suggested he make his application here. He claimed he was the first Chinese in the US to be granted citizenship.